Did you just type three hyphens to draw a horizontal line in Word and cannot get rid of it? Here's how to delete it. A horizontal line can be placed in Word by typing three hyphens and hitting Enter. Lines of different styles can be drawn by typing three equal signs etc. The reason they are un-deletable and annoying is that they are entered as a "border". If you placed the line after a paragraph, the paragraph got a border. 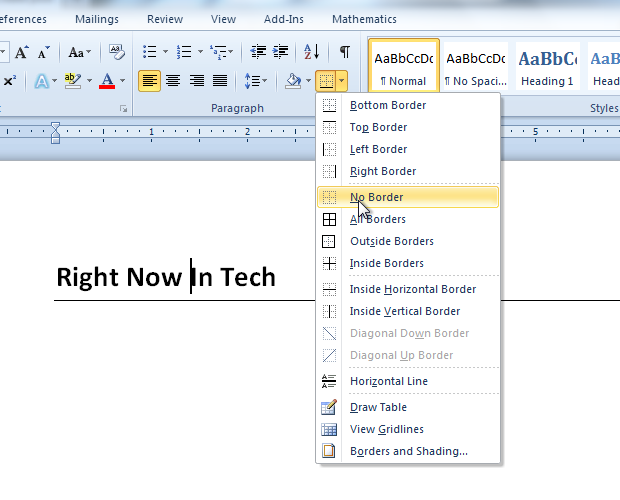 To remove the line, place your cursor just above it and select "No Border" from the borders menu on the ribbon's Home tab. Your horizontal line (or border) will be gone!